Finally I made this journey. Actually, ‘finally’ is not an appropriate word to use here. It wasn’t something I was looking so much forward to. After staying in hills for almost a year and travelling by road under the sedative effect of mountain sickness tablets, I do not feel keen for any road trip unless it is bike or the destination promises some wonder of the world. My parents came here with the expectation that I am one of those good sons (read श्रवण कुमार) who considers it his most important duty of life to take his parents to the pilgrimage spots of the world. So they came here to see चार धाम of Uttarakhand in a span of 10 days. They forgot their age and weight and the fact that the roads to these 4 places are not straight but serpentine ones, and most importantly the fact that I am not one of those good sons! I felt bad to disappoint them. 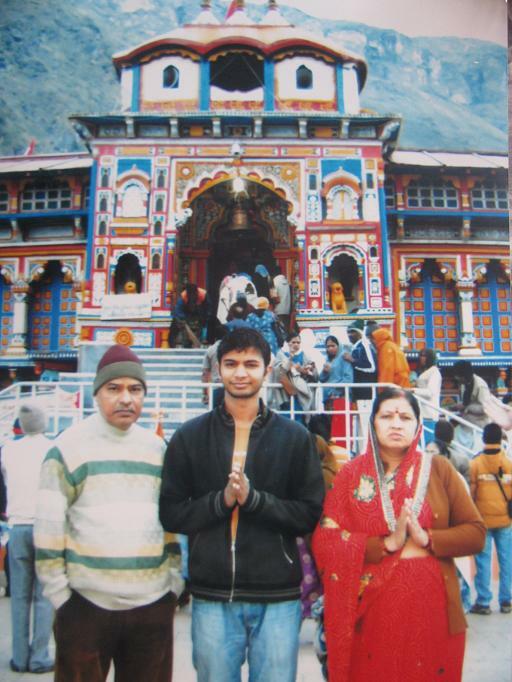 But I took them to Badrinath – one of the 4 sacred places for Hindus. In the temple, we had do the दर्शन which I wasn’t so much interested in, but my mom was, in fact most interested in! My parents wanted a quick peek at the God’s statues. I never wanted to be part of that dirty game of shortcut to god, but looking at their old weak legs and their insistence I had to pull some strings. I detested every single second of that time from the moment I started making arrangements for back door entry to main temple to the time we were out. The main queue outside the temple consisted of the common people, who either had no extra money or power for back door entry or no intention to catch a glimpse of god through these ways. I entered through the other door. Here I saw a secondary queue. It was quite visible that these people knew the power of money. I felt a storm of questions in my head to justify or reject my presence in that area. The people here were a mixed lot – south Indians-north Indians, east Indians-west Indians, white Indians-black Indians, young Indians-old Indians – in short all Indians. They all had many similarities. They made every possible attempt to gain a spot inside the temple that can offer the closest and most direct view of the deity. My mom was shouting to inform me that she had obtained one such spot and that I should come to her to seek ‘direct’ blessings of the god. Now I shouted back through eyes and signals to tell her to close her eyes and fold her hands and try to see Lord Badri inside her heart if she could. In fact, people did not mind trampling others in the process. Every body was trying to ensure that his/her family should get those direct blessings, let the rest of the world die! I felt quite surprised to see this at the most revered place in the world for Hindus. I could not understand that now, that they are so close to that thing which they call ‘God’, why don’t they close their eyes while standing at any place in the premises of temple, and try to feel the God’s presence. Forget Hindus, forget Indians, forget family etc. Does not a man’s worshiping god mean to achieve God, to establish a dialogue with God, to be one with God? I did not see this in even one person. Priests were giving the blessing – ‘your business should flourish’, ‘your family should stay happy’, ‘you should have joy and prosperity’, ‘you will get money’, ‘you should get good health’. I did not hear any one saying – ‘may your heart fills with kindness and love and forgiveness for all beings’, ‘may you feel oneness with the world and the God’, ‘May you get rid of all such things as greed or anger or laziness’. People’s desires and priests’ blessings were all so narrow and focused to the family of person, that even at Badrinath, there’s no one to guide people the way Kabir, or Meera, or Mother Teresa did through their lives. What sort of भक्ति is this that is devoid of ममता, प्रेम, and स्नेह? Various Hindi news papers call these people श्रध्हालू and तीर्थ यात्री and describe all this as if this is some journey to heaven. But when people are pushing each other, shouting at each other, there’s no love or kindness and without these, can there be a prayer? The only people who I thought were doing real worship here, were a couple of young men who were distributing free coffee and sweets in the cold night to any one who would pass by. Off late, I find no better way of praying than serving. And now all those ‘pilgrims’ who were enjoying this free coffee were littering around with the coffee cups. All the way on National Highway to Badrinath, I found every one throwing plastic and trash so mercilessly on road that I was wondering what पुण्य are these people going to earn at Badrinath when they spoil the mother earth this way. Every throw of plastic would give a severe blow to heart and somehow I managed to control myself. What right these people from rest of India have to come to hills and spoil the place and begin the process of converting the place into a trash bag that are coming from? All these rich and powerful people wearing Armani shades, are they not cultured enough to have the least civil sense? I have this curiosity now that why temples have a deity in a closed and badly spaced room. I suggest that we erect a single huge statue of god placed at a height or in a large space and statue be placed in an open space protected by barricades. No one should be allowed to come close anywhere in the 5 kms radius of the statue. Statue should be so huge that it is visible from distance. This way, there will be no secondary queues for close glimpse of God. Anyone will be able to see it. Then give the challenge to people to now feel God from wherever they are standing and viewing the God. Posted on May 24, 2010 by rajeevgupta	• This entry was posted in Uncategorized. Bookmark the permalink. hey three windmills, thanks for ur comments.. do we know each other by any chance? oh yes… all bells rung now!